Events run by the Queensland Mycological Society (QMS) provide an excellent opportunity to discover the amazing Kingdom of Fungi. Get to know your local macrofungi by attending QMS forays (field trips). Meetings are informative and entertaining. Going to workshops is another great way to learn more about fungi and develop identification skills. On 5th November 2005, the Cubberla-Witton Catchments Network Inc held a fungi conference in Brisbane. Seminars were presented by mycologists from around Australia. This was attended by 150 enthusiastic people who subsequently expressed interest in forming a macrofungi interest group. At a public meeting on 8th December 2005 it was decided to form the Queensland Mycological Society (QMS), with membership open to anyone with an interest in the discovery, survey or research of macrofungi. QMS became incorporated on 14th May 2006. Promote the conservation of indigenous macrofungi and their relevant ecosystems. QMS meetings are held in the FM Bailey room at the Queensland Herbarium, Mt Coot-tha on the second Tuesday of each month, excepting January, and commence at 7 pm. Meetings include a range of activities: Foray reports, Fungal interest talks, ‘Show and Tell’, and sometimes a guest speaker. We enjoy supper and a chat and leave by 9 pm. The Queensland Mycological Society welcomes new members whether they are experienced mycologists, amateurs, or beginners who want to know more about mushrooms. The gasteromycete depicted on the QMS logo has the common name “Earth Star”. 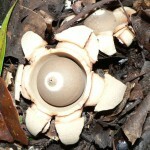 This is reflected in the genus name – Geastrum – which translates as ‘geo’ = earth, and ‘aster’ = star. Mature specimens of this genus are very easy to recognise – the outer covering (the exoperidium) and its lining the mesoperidium split open and unfold away from the central sac (the endoperidium), to give the appearance of a ball resting in the centre of a star-like bed. In some species these stellar points eventually bend backwards so far as to form a ‘stand’ supporting the endoperidium. This central sac has a slightly pointed bump (the peristome) at the apex which opens to release puffs of spores into the air. QMS acknowledges and appreciates the support that has been given to the Society by the Queensland Herbarium.